From the moment we wake, we continually experience a huge range of sensory information from the world around us; audible, visual, tactile, olfactory, gustatory, vestibular and proprioceptive as well as interoceptive. The information is fed through our peripheral nervous system, to our central nervous system and then we organize a response to the input. In short, we have to learn how to react to these different stimuli. How we choose to respond will depend on our previous experiences. 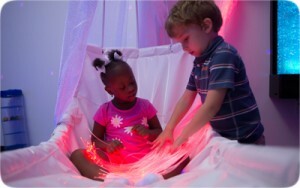 Sensory play is not only fun, but is a fundamental part of early human development. The more exposure to stimuli, the more established the neural pathways in the brain will become and our response often becomes more efficient. We need to learn what to do if we smell fire, if something is too hot, or too cold, how to self-manage ourselves in accordance to the stimuli presented to us in everyday life. Playing and experiencing sensory input in our early years helps us to develop our skills at reacting effectively to different input – forming what we like and dislike, understanding what things looks and feel like, and what they relate to. These basic elements help us organize our responses – the way in which we make decisions to act or behave, becoming the foundation of our human selves and often part of our unconscious functioning. As well as developing sensory processing, encouraging young children to engage with different activities can improve fine and gross motor skills and enable professionals and parents to watch and assess a child’s ability levels in an informal manner. Observation may highlight specific needs or sensitivities to certain types of input – such as light or sound and enable support to be purposefully offered. There are so many different parts of a multisensory environment that can help children explore their senses and develop their processing skills. 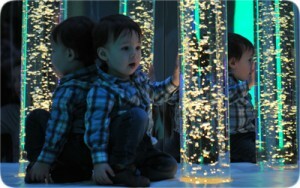 These might be small items that are bought into the space for play, such as small tactile balls, objects that light up or switches that help children understand cause and effect. Fixed items such as bubble tubes offer opportunities for observing movement, counting inclusions such as fish or balls, feeling vibration, and discrimination between different textures and temperatures. The teacher, healthcare professional or parent are offered a multitude of different opportunities to play, explore, and start to learn – it is an environment where the emphasis is on being creative and developing tailored meaningful activities for the young child you are nurturing.